6.30pm: ABOUT a dozen people in green shirts were seen to leave the grounds as the premier spoke during her official address. 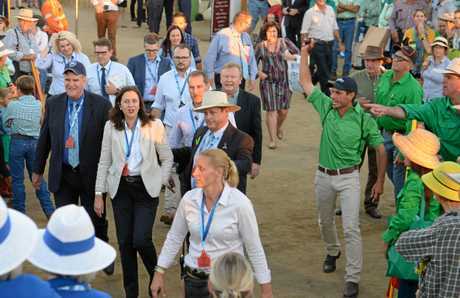 5.40pm: HUNDREDS of angry graziers gave Queensland Premier Annastacia Palaszczuk a hostile welcome when she attended the Beef Australia 2018 official welcome reception this afternoon. 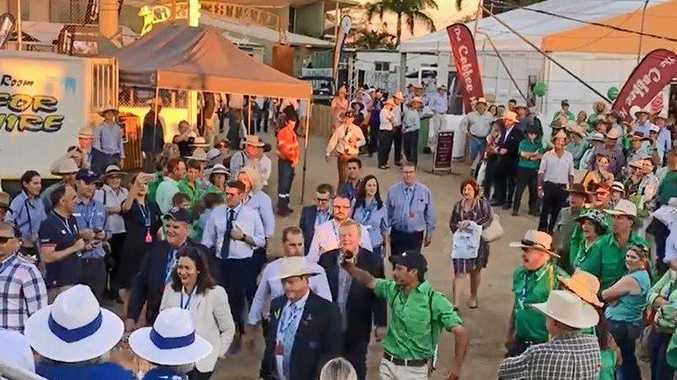 As the Premier walked impassively through the expo site at the Rockhampton Showgrounds in the company of Beef Australia officials a large mob of graziers, mostly dressed in green shirts, chanted loudly "Go away Palaszczuk, go away Palaszczuk, go away Palaszczuk". They were protesting the Queensland Government's new vegetation laws which they say will cripple the growth of agriculture in the state. A smiling Ms Palaszczuk made her way from the expo entrance to the official function at the Qantas International Lounge, briefly stopping to answer questions for a media throng. The Premier said she had heard their message but her Minister for Agricultural, Mark Furner, would continue to "work with the industry". "That's what we're going to do," she said before moving on. Before she arrived State Opposition leader LNP Leader Deb Frecklington, dressed in a green blazer, walked into the expo to loud cheers from the same graziers. Farmers and those opposing the laws have been urged to dress in green to symbolise their plight. She has previously slammed the Labor Government for its "arrogance" over the new laws passed last week. "They have silenced the voice of our farmers and rural and regional Queensland by ramming their contentious and damaging vegetation management laws through Parliament," Ms Frecklington had said.